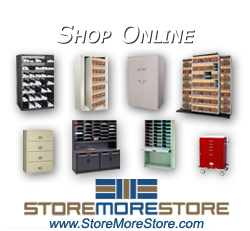 High density tab filing systems by Southwest Solutions Group in Texas, Oklahoma, Kansas, Arkansas, and Tennessee save a large amount of floor space in your filing areas. These space efficient high density shelving systems save 2 to 3 times the space in your filing system over traditional filing cabinets. Use half the space and get the same filing capacity with a high density shelving system. Lease or build less space. A recent client invested in 17 high density shelving systems for their filing areas, and showed a Return on Investment (ROI) of less than 16 months. High density shelving saves space, and with color-coded shelving solutions they can increase productivity over 35% in your centralized filing system. Let our team perform a no fee analysis of your filing area to demonstrate how a high density shelving system could make sense for you. Once a client sees how a high density system like this can assist in a filing area, they never go back to traditional filing cabinets. Did you know that the average filing cabinet costs more than high-density shelving , and uses a lot more floor space? Over 5,000 other companies in Texas, Oklahoma, Kansas, Arkansas, and Tennessee have high density shelving in their filing areas. 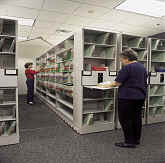 These shelving systems will provide a state-of-the-art filing solution for your team. Powered high density shelving units have built-in electronic safety features that protect the users of the filing system. Don’t forget your automated file labeling software to also save you time.